For 30 years, Joseph Sohm has licensed his portrait of America, to America and the world. His images are published more 50,000 times in publications such as the National Geographic, NY Times, Washington Post, Wall Street Journal, and seen on CNN, MSNBC and ABC. Sohm’s photographs have been featured by most of the Fortune 1000, including advertising for IBM, Apple, Ford, Sony, Kodak, Fuji, Citibank, Continental Airlines, Fidelity Investments, Merrill Lynch, Motorola, Microsoft, NY Life, Macy’s, and many more. Whether it's a book cover, brochure, textbook, website or video, Visions of America image sizes and rights can be customized for your project’s needs. Industry and Exclusive Rights are also available. For more information please email info@visionsofamerica.com or call (805) 649-2555. 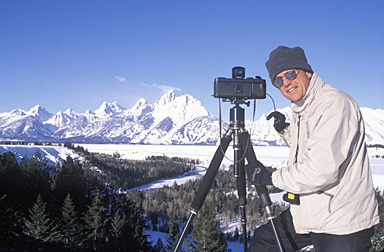 Joseph Sohm shooting the Grand Tetons with with his panoramic camera in Jackson Hole, Wyoming.